The human bone is a highly dynamic organ that maintains its homeostasis through a delicate balance between the bone-forming osteoblasts and the bone resorpting osteoclasts. The dynamic balance between these two types of cell results in bone remodeling [1-4]. Osteoporosis, a systemic skeletal disease characterized by low bone mass and micro-architectural deterioration of bone tissue due to an imbalance between osteoclast mediated bone resorption and osteoblast mediated bone formation [5-7]. Current drugs used to treat osteoporosis are bone resorption inhibitors including parathyroid hormones (PTH), PTH receptor analogues, bisphosphonates, calcitonin, estrogen and vitamin D analogues, which maintain bone mass by inhibiting the function of osteoclasts [2, 8, 9]. However, the low efficacy and possible side effects are the real challenge of these drugs to use . Therefore, a sustainable drug is desirable to identify better and safe anabolic agents with low cyto-toxicity that act by either increasing the osteoblasts proliferation or inducing osteoblasts differentiation which can enhance bone formation [10, 11]. Several lines of evidence have shown that foods rich in flavonoids, such as fruits, vegetables and tea may be related to bone loss and fracture outcomes [12, 13]. Flavonoids are a large class of phyto-chemicals that are widely distributed in plant foods [14-17]. Flavonoids have been found to decrease urinary excretion of calcium and phosphate, increase osteoblast activity, decrease osteoclast activity, and protect against the loss of trabecular thickness [18-20]. Previous studies showed that different plant-derived flavonoid compounds can stimulate osteoblasts function, and inhibit osteoclasts functions either alone or in combination. Due to their natural occurrence and lack of side effects, flavonoids are considered to be safer than the conventional drugs replacement therapy as preventive measures against various diseases including osteoporosis . Recently, we found the inhibitory effects of TPFs on osteoclast differentiation bone resorption . TPFs significantly suppressed the RANKL-induced differentiation of osteoclasts and formation of pits in primary osteoclastic cells. TPFs also decreased expression of osteoclast differentiation related genes including Trap, Cathepsin K, Mmp-9, and Mmp-13 in primary osteoclastic cells . To evaluate the effects of TPFs on osteoblast differentiation, staining for ALP was performed as an early-differentiation marker of osteoblasts derived from newborn mouse calva-ria. The results showed that TPFs enhanced the intensity of ALP staining and activity (Fig. 1a-c). TPFs also increased the mRNA expression of Alp (Fig. 1g). To determine mineralization, calvarial osteoblasts were cultured with TPFs for 21 days. TPFs dramatically increased the mineralized area visualized by Alizarin red S staining for calcium (Fig. 1d). 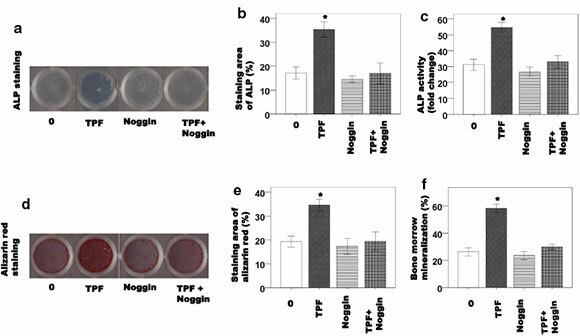 Osteocalcin in the culture media was elevated after the treatment of TPFs (Fig. 1e, f). Subsequently, the mRNA expression of osteocalcin was measured as a late-stage marker of osteoblast differentiation. Treatment with TPFs significantly increased the mRNA expression of osteocalcin compared with control cells (Fig. 1h). 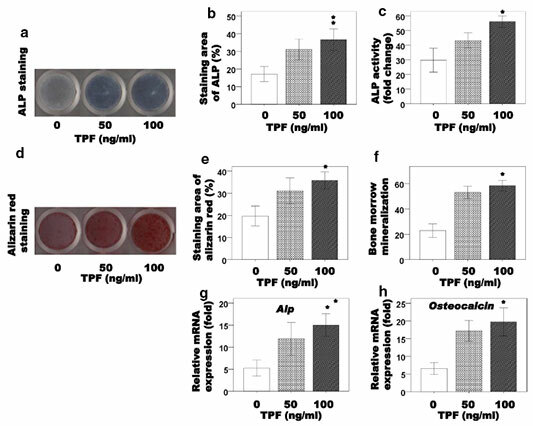 These findings indicate that TPFs promote the osteoblast differentiation bone formation. After that, we investigated the effects of TPFs on the expression of mRNAs related to osteoblast differentiation. 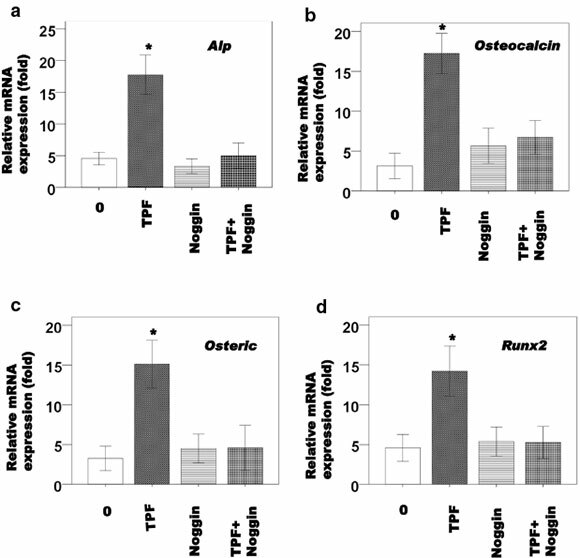 TPFs treatment for 6 days significantly enhanced the expression of osterix and Runx2 mRNA, which encode an essential transcription factors for osteo-blast differentiation, in calvarial cells (Fig. 2a, b). To confirm what kinds of BMPs are involved in TPFs-induced osteoblast differentiation, we evaluated Bmp-2, Bmp-4 and Bmp-7 mRNA expression level after TPFs treatment. The results revealed that TPFs increased the expressions of Bmp-2, Bmp-4 and Bmp-7 genes (Fig. 2c-e). We confirmed the effects of noggin, a BMP specific antagonist on TPFs-induced osteoblast differentiation using calvarial osteoblastic cells. Noggin inhibited TPFs-induced ALP activity (Fig. 3a-c) and mineralization (Fig. 3d-f) in calvarial osteoblastic cells. Noggin also inhibited TPFs-induced expression of Alp, osteocalcin, osterix, and Runx2 mRNA level in calvarial osteoblastic cells (Fig. 4a-d). In the present study, we demonstrated that TPFs stimulated osteoblast differentiation in the calvarial osteo-blastic cells isolated from the calvariae of newborn mice (primary osteoblastic cells). Treatment of primary osteo-blasts with TPFs results overexpression of the Alp gene and increased ALP activity (Fig. 1). Besides upregula-tion of ostocalcin, TPFs treated osteoblasts also showed significant upregulation of osterix, Bmp-2, Bmp-4 and Bmp-7 compared to control group (Figs. 1h, 2). Osteoblasts play a crucial role in the bone formation, differentiating from mesenchymal stem cells is regulated by many growth factors including BMPs, Runx2 and Osterix [3, 4, 23]. Role of these growth factors in osteoblast differentiation and bone formation is well known. Runx2 and osterix deficient mice lacked bone formation because of the maturation arrest of osteoblasts [6, 24-26]. In addition, several lines of evidence have shown that the BMPs expression levels are up-regulated during bone regeneration and that BMPs stimulate osteoblast differentiation and bone formation [27-33]. The osteogenic differentiation is obtained through induction of ALP activity and expression of bone matrix protein osteocalcin [4, 34]. Traditional medicines play an important role in health services around the globe. The rational design of novel drugs from traditional medicine offers new prospects in modern healthcare [35-37]. Dietary habits are known to play a role in the prevention of osteoporosis. Some studies investigated that the potential benefits of fruits, vegetables, tea, and herbs on bone metabolism . It was showed that the consumption of vegetables and fruits inhibited bone resorption in rats better than meat or milk. The meat and milk products commonly believed to be beneficial for bone health . In Bangladesh, Tridax procumbens flavonoids are made into paste and applied on fresh cuts . Decoctions of the flavonoids from Tridax procumbens leaves and root bark have been traditionally used for treatment of dropsy, anaemia, arthritis, gout, ulcer, piles, and urinary problems . TPFs also used in the treatment for fever, typhoid, cough, diarrhea, gastric problems, body pain, and rheumatic pains of joints [42, 43]. TPFs have antimicrobial effects such as antibacterial, antifungal and antiviral [44-46]. Recently, our study showed that TPFs can inhibit the osteoclasts differentiation and bone resorption . This study investigated the direct effects of TPFs on induced-oste-oblasts differentiation in the primary osteoblasts. This result suggested that TPFs is a potent agent stimulating osteoblasts differentiation of calvarial osteoblastic cells. Osteoblast maturation is a key step in the process of bone development [47, 48]. Therefore, TPFs may promote bone formation by stimulating osteoblast maturation, rather than by its cytotoxicity. We have shown that TPFs induced osterix, and Runx2 mRNA expression in calvarial cells (Fig. 2). TPFs induced increase in the Runx2 mRNA expression level may be involved in induced stimulatory effects on osteoblasts differentiation of calvarial osteoblastic cells. However, further clarification is necessary to get an insight that is these TPFs stimulated osteoblast differentiation occurred via Runx2-dependent or Runx2-independent pathways. These studies will provide important information for identifying the target molecules of TPFs in osteoblast differentiation. In summary, this is the first study to show that a natural compound, TPFs, isolated from Tridax procumbens stimulatory effects on osteoblast differentiation mineralization. These results suggest that TPFs is a candidate anabolic agent for stimulating bone formation. This effect of TPFs treatment will be useful and might be a promising therapeutic agent for bone diseases such as bone repair and osteoporosis. The Tridax procumbens plant was collected from the northeast part of Bangladesh. After its identification by Professor Dr. Anwar Ul Islam, Department pharmacy, Rajshahi University, Bangladesh, a voucher specimen (Ref. GEB09032014/3) was submitted to the Plant Biotechnology laboratory, Department of Genetic Engineering and Biotechnology, Shahjalal University of Science and Technology, Sylhet-3114, Bangladesh. The experimental procedures were reviewed and approved by the Ethical Committee of Shahjalal University of Science and Technology, Sylhet, Bangladesh. Different plant parts of Tridax procumbens (root, stem, leaf, and flowers) were separately shade dried, finely powdered using a blender, and subjected to extraction of TPFs in following the method as described elsewhere [22, 43, 49] with some modifications. Briefly, two hundred grams of each finely powdered sample was Soxhlet extracted with 80 % hot methanol (1000 ml) on a water bath for 24 h and filtered. Filtrate was re-extracted successively with petroleum ether, ethyl ether and ethyl acetate using separating funnel. Petroleum ether fractions were discarded as being rich in fatty substances, whereas ethyl ether and ethyl acetate fractions were analyzed for free and bound flavo-noids, respectively. Ethyl acetate fraction of each of the samples was hydrolyzed by refluxing with 7 % H2SO4 for 2 h for removal of bounded sugars from the flavo-noids. Resulting mixture was filtered and filtrate was extracted with ethyl acetate in separating funnel. Ethyl acetate extract thus obtained was washed with distilled water to neutrality. Ethyl ether and ethyl acetate fractions flavonoids were dried and weighed. The extracts were stored at 4 °C for farther used and were re-suspended in their respective. Total flavonoids content of each extract was determined by aluminum chloride as described elsewhere [50, 51] with some modifications. Briefly, plant extracts (0.5 ml of 1:10 g/ml) were separately mixed with 1.5 ml of methanol, 0.1 ml of 10 % aluminum chloride, 0.1 ml of 1 M potassium acetate and 2.8 ml of distilled water. It remained at room temperature for 30 min. The absorb-ance of the reaction mixture was measured at 415 nm with a spectrophotometer, and quercetin was used as a standard for calibration curve. Total flavonoids values are expressed in terms of mg equal quercetin in 1 g powder. Penicillin, streptomycin, a-minimum essential medium (a-MEM), and fetal bovine serum (FBS) were purchased from Invitrogen (Carlsbad, CA, USA). Recombinant soluble human M-CSF, human RANKL, collagenase A, dispase, alizarin red, fast blue BB salt, naphthol AS-MX phosphate, Dulbecco's modified Eagle's medium (DMEM), and all other reagents were purchased from Sigma-Aldrich (St. Louis, MO, USA). Mice calvarial osteoblasts were obtained from neonatal mice as described elsewhere . Briefly, calvaria from fifteen 1-day-old C57BL/6 mice were pooled. Following surgical isolation from the skull and the removal of sutures and adherent mesenchymal tissues, the calva-ria were subjected to sequential digestions at 37 °C in a solution containing 0.1 % dispase and 0.1 % collagenase P. The cells from the second to fifth digestions were collected, centrifuged, resuspended, and isolated cells were cultured in a T-25 cm2 flask in a-MEM containing 10 % FBS and 1 % penicillin/streptomycin. Cell culture medium was replaced in every 3 days. When osteoblast cells reached 80 % confluence, they were harvested with 0.25 % trypsin-EDTA solution. The cells were seeded in 96-well plates and 6-well plates at a density of 1 x 104 and 1 x 106 cells/well, respectively, and cultured in a humidified atmosphere of 5 % CO2 and 95 % air, at 37 °C. After cultured in 6-well plates with TPFs at concentrations of 0, 50, and 100 ng/ml for 48 h, osteoblasts cells were analyzed for ALP activity by ALP staining and ALP activity assay. For ALP staining, cells were rinsed twice with phosphate-buffered saline (PBS), fixed with 2 % paraformaldehyde. ALP substrate mixture was then added and incubated for 15 min for color development. For ALP activity assay, cell layers were scraped off culture plates in scraping buffer. Cell pellets were collected after a quick spin. Cells were then lysed in ALP lysis buffer and subjected to 3 freeze-thaw cycles. After centrifuge at 14,000 rpm for 5 min, supernatant was collected. 20 ul supernatant from each sample was added to each well in duplicates in a 96-well plate and incubated with an assay mixture of p-nitrophenyl phosphate. Plates were then scanned for spectrophometric analysis using a plate reader (T60 U, PG Instruments Ltd., England). Absorbance was measured at 405 nm every 5 min for 30 min. Activity was calculated of ALP staining positive cells using an image analyzing system (KS 400; Carl Zeiss, Jean, Germany) were performed on culture day 6, as previously described [52, 53]. Osteoblast maturation was determined by evaluating cell mineralization using the Alizarin red S dye staining protocols. Osteoblasts were treated with TPFs at concentrations of 0, 50, and 100 ng/ml for 21 days. After drug treatment, osteoblasts were washed with ice-cold phosphate-based saline (PBS) buffer (0.14 M NaCl, 2.6 mM KCl, 8 mM Na2HPO4, and 1.5 mM H2PO4) and then fixed in ice-cold 10 % formalin for 20 min. For the Alizarin red S dye-staining protocol, the fixed osteoblasts were rinsed thoroughly and then incubated in 1 % alcian blue pH 2.5 for 12 h. The sections were then incubated in Alizarin red S for 8 min, dehydrated briefly in xylene and cover slipped in per-mount. Mineralized nodules were visualized and counted using an image analyzing system (KS 400; Carl Zeiss, Jean, Germany) were performed on culture day 21, as previously described [52, 53]. Each experiment was performed in duplicate wells and repeated three times. Osteoblasts cells were seeded in 6-well plates at a density of 1 x 106 cells/well. After 6-day culture, cells were treated with TPFs at concentrations of 0, 50, and 100 ng/ ml for 48 h. Total RNA from the cells of each well was isolated, respectively using NucleoSpin (Macherey-Nagel, Duren, Germany). RNA aliquots were reverse transcribed to complementary DNAs by using an oligo (dT) primer (Roche), deoxynucleotide triphosphate (dNTP), and Moloney murine leukemia virus (M-MuLV) reverse transcriptase (Fermentas, Hanover, MD, USA). The complementary DNA products were subjected to PCR amplification with gene-specific primers for mouse osteocalcin, Runx2, osterix, Alp, Bmp-2, Bmp-4, and Bmp-7 (Table 1). Real-time RT-PCR amplification was performed using a LightCycler System (Roche) with a Platinum SYBR Green qPCR SuperMix UDG kit (Invitrogen, Carlsbad, CA, USA). We used analysis of variance with an F test, followed by a t test. P values less than 0.05 were considered significant. The data are presented as mean ± standard deviation values of independent replicates. MAAM designed of the study, carried out experimental work on biological investigation, choice of assay methods, critically reviewed the manuscript and proof read. MJH, KI, AK, MMA and MAAB assisted in data analysis and interpretation. All authors read and approved the final manuscript. This research work was supported by the Shahjalal University of Science and Technology, Sylhet-3114, Bangladesh Research Grant-2014.